Jesus wants to be with you! Christine, Eva, Enrique and Joseph learn about the real presence of Christ in the form of the Eucharist, and how they take part in a special miracle every Sunday at Mass. Join them as they prepare for their first Holy Communion, celebrate the Feast of Corpus Christi, and more during My Time With Jesus - First Communion!. 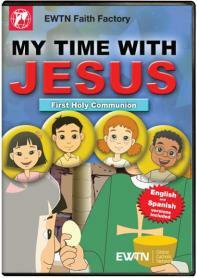 Episodes included are: Preparing for First Communion; My First Communion; Receiving Jesus in Holy Communion; and Corpus Christi., 2 DVD Set / 2 Hours (CC), In English or Spanish., Children's animated series as seen on EWTN. St. Monica DVD - My Catholic Family EWTN DVD Animated Video Series - 30 min.